Design is increasingly about people’s behaviour, but this is often considered simplistically. Design with Intent aims to give practitioners a more nuanced approach to design and behaviour, working with people, people’s understanding, and the complexities of everyday human experience. It’s a collection of design patterns—and a design and research approach—for exploring the interactions between design and people’s behaviour, across products, services and environments, both digital and physical. 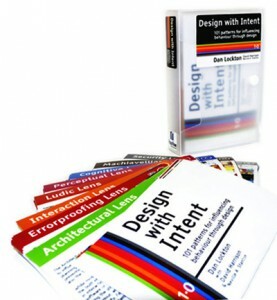 The Design with Intent toolkit card deck was originally released in 2010 (free download), and an updated and expanded Design with Intent book is in progress: please sign up for the newsletter to be kept updated! Design with Intent is aimed particularly at socially and environmentally beneficial behaviour change. The patterns are drawn from a range of disciplines, and are phrased as provocations to enable use as both a workshop tool, and a guide for exploring the field. Copyright © 2019 Design with Intent. Powered by WordPress. Theme: Accelerate by ThemeGrill.